The National Bowling Association, Inc. offers a wide range of handicap and scratch adult and youth bowling tournaments available to our members. There are four (4) national, eight (8) regional, and a plethora of local tournaments held throughout the United States. Are you TNBA Ready??? Are you ready to lace them up and get busy?? Do you ever wonder how you measure up to the best of the bowlers? Are you ready to compete?? Are you Rhodman Ready!!! Entry forms are waiting for you. New this year are guaranteed prize funds. The Regional Rhodmans are ready to take you on. Are you ready to see what you are made of?? 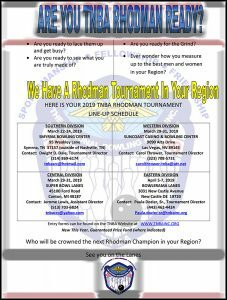 Click on the Rhodman flyer for regional schedule of events. 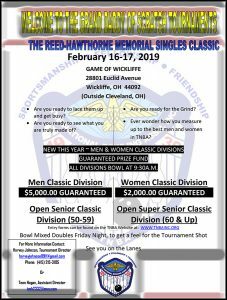 February 16-17, 2019, Welcome to the Grand Daddy of Scratch Tournaments — The Reed-Hawthorne Memorial Singles Classic. With over $7,000.00 in guaranteed prize funds, this tournament will show your true grit!! Entry forms may be found on the tournament pages listed below; click on the flyer above for flyer download.